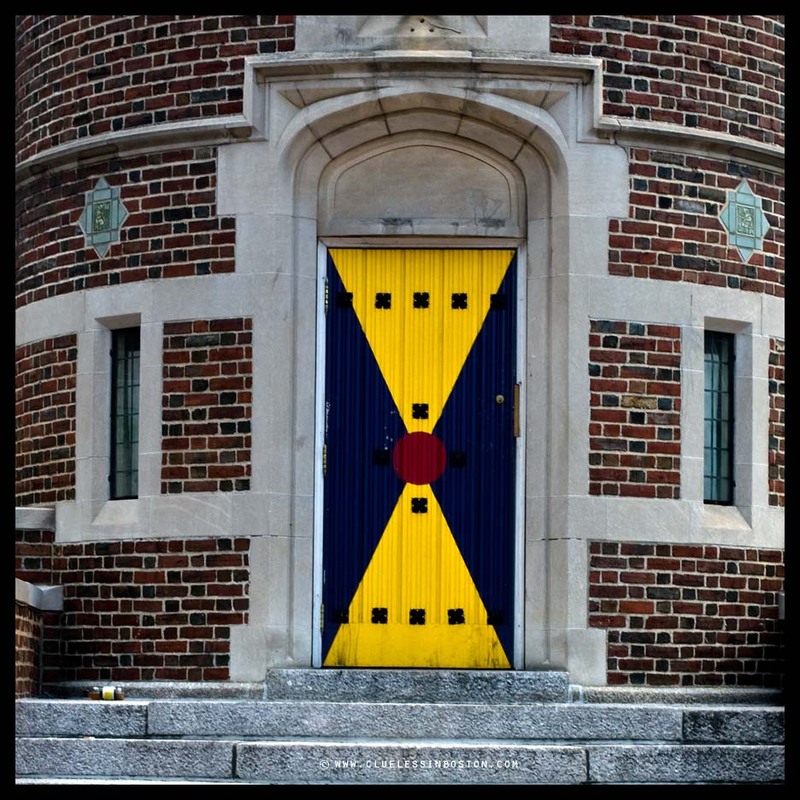 This weeks Doorway is the Harvard Lampoon brightly colored door you see above. Located at the intersection of Mt. Auburn, Bow, and Plympton Streets on a triangular bit of land stands an odd-shaped building that has a turret at one end. This building is the Harvard Lampoon Building, or Harvard Lampoon Castle, as it is some times called. The brick building has several features that make it stand out despite its diminutive size. First, it is a narrow, wedge-shaped building that fits within the confines of the parcel. This makes the building appear to be in the middle of the road. Next, the turret that is between Bow and Mt. Auburn Streets has a brightly colored door. On the apex of the pointed roof is an ibis. Third, it has distinctive sides that have a Flemish style architecture to them. Near the top on the Mt. Auburn Street side are two dates: 1906, when the building was built, and 1875, when the Harvard Lampoon Club was founded. 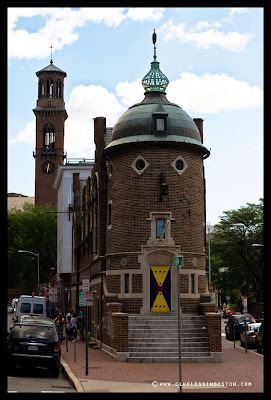 The building was designed by Edmund Wheelwright and built for the Harvard Lampoon Club, a social club. This club publishes the Harvard Lampoon, which is currently the longest running English-language humor magazine. That's great. This doorway is an eye-catcher. The building looks beautiful too. At first I thought it was a lighthouse! Very unusual and striking! I love both, building and door. The design on the door is looking like a maritime flag!What a funny and strange little building!Very unusual, but full of charm! So unusual and unique building you show us today. I see the face at the second photo, funny face. One of my most favorite buildings in town. Used to go to a coffee shop just opposite it. I'm sure it is long gone by now. When I looked at the door alone in the first shot it made me think of radioactive warning icons but it really does make a face out of the facade as is seen in the second shot. So interesting building!I like the yellow energetic colour there.I think its a modern door for this building.A kind of contrast! What a great building and I don't think I've ever seen a picture of it before! I like the yellow on the door too. Drop by Levonne's Pretty Pics and A Camp Host Housewife's Meanderings when you have a few minutes. I'd love to hear what you think of my newer work. The painting on the door looks like some cult symbol. Cool building and great shots! The door alone is already eye-catching, but taken altogether, it's even more so! Somehow, it looks quite right for the mag. Oh, and I see a face too! haha, amazing doorway. :) How creative!